Darkened teeth – Over time, our teeth experience changes in dentin, the bone-like tissue that is underneath tooth enamel. This can be caused by a lifetime of consuming certain foods and beverages that cause stains, and the thinning of enamel. Dry mouth – Medications, cancer treatments and other diseases can cause reduced saliva flow resulting in dry mouth. 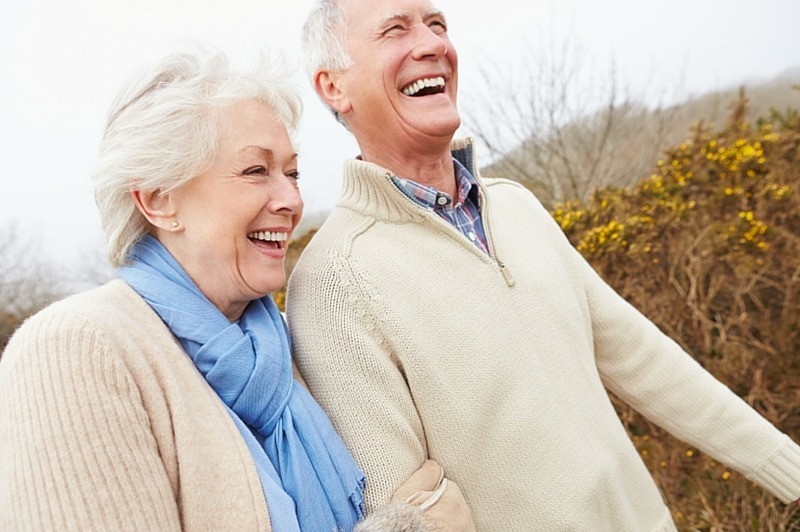 Gum disease – Gum disease is especially prevalent in seniors. Plaque, tobacco products, poor diets and a slew of other actors can cause gum disease. Root decay – Over time, gum tissue can recede from the teeth and cause the roots to become exposed and decayed. Tooth loss – Seniors are more likely to experience gum disease, which is directly related to tooth loss. Good oral hygiene throughout your life, and especially in advanced age, is necessary for maintaining overall health. It’s important to brush your teeth and floss regularly as well as visit your dentist every six months for a cleaning and dental exam. – Brush your teeth after meals and at least twice per day, but don’t overdo it as excessive brushing can wear down your gums and enamel. – Brush for two minutes and don’t bear down too hard. – Rather than brushing from side-to-side, hold your toothbrush at a 45-degree angle to your gums and brush with an up-and-down motion. – Brush the outer and inner surfaces of your teeth as well as your tongue and other hard-to-reach areas of your mouth. – Guide your floss between your teeth with a gentle rubbing motion. – As the floss reaches your gum line, curve it in a C shape against the tooth. – Be gentle and don’t overdo it as excessive flossing can cause gum irritation. Part of maintaining good oral hygiene is visiting an experienced dentist regularly. At Daxon Dentistry, we are committed to helping you maintain good oral hygiene and giving you a smile you can be proud of. To schedule an appointment with us, click here, or visit our blog to read more helpful oral hygiene tips.